At the Croquet Association AGM in October, three CA Awards were presented to Fylde Croquet Club, Ken Cooper and Francois Garcia. 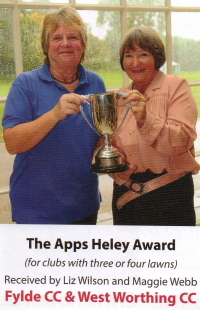 The Apps Heley Award for improvements to clubs with three or four lawns was awarded jointly to Fylde CC and West Worthing CC. Ken has only been the NW Federations Coaching Officer for the last three years and in that time he has totally revolutonised the ‘thinking and active involvement’ of all our Clubs and individual players into the benefits of good progressive, croquet coaching. Ken was charged with the job of changing player’s attitude towards competitive play and thereby help develop the quality of our League Games throughout the NWFCC Region. He set about this in earnest by gathering together several of the Federations other coaches and getting their support to assist him in running courses at the various levels required. 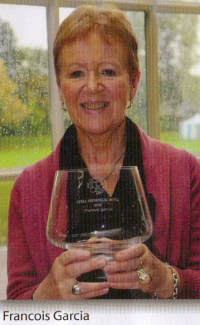 Awarded to the most improved female Association Croquet Player in 2012. Francois started the 2012 season on a handicap of 4 after having had a successful season in 2011 culminating in winning the Bowdon B-level event. In 2012 she decided to concentrate on advanced play. While not winninmg any competitions she reduced her handicap to 2.5 and her Dynamic Grading has increased from 1512 to 1685. She reached the final of the Bowdon B-level event again but had to withdraw because of injury. For the same reason she had to withdraw from the Bowdon B-level weekend tournament. This cut her playing season by 20% which makes her improvement in 2012 even more of an achievement. Southport receiving Longman Runners Up Tankard from Quiller Barrett (President of CA). 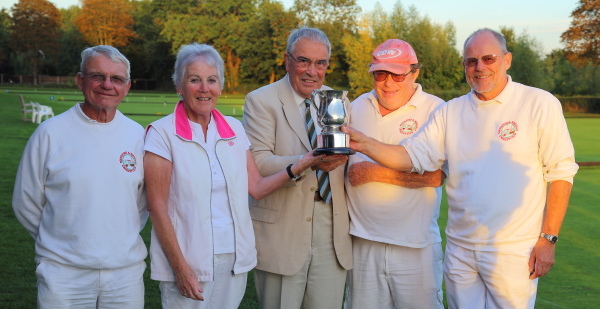 The Southport team of Carol Lewis, Tony Thomas, Brian Lewis and Alan Farrell, turned out in determined mood for the Longman Cup in Surbiton. In glorious weather, Southport fielded their squad on some of the best lawns in the country in the Semi-Finals against the pride of Midlands croquet – Nottingham. This proved to be a tough match with every game hard fought. In a closely played doubles game, Carol and Brian Lewis just lost out to a very good Nottingham pair, whilst on the other lawn, Alan Farrell played with amazing skill for the first Southport win of the match. Tony Thomas felt the full power of the opposition, falling behind early, to thankfully claw his way back into the game to give Southport another win by plus one on time. Lunchtime score Nottingham 1 Southport 2. In the afternoon singles games, Brian Lewis failed to contain his Nottingham opponent as the sides drew level 2-2. But Tony Thomas had a good win to restore Southport’s lead at 3-2. The remaining singles games were nail biting affairs with players giving their all and no one could sustain any advantage. But with time running out, Alan Farrell achieved the critical break out to produce the vital win. Meanwhile Carol Lewis with almost the last turn of her game came from behind to secure another glorious victory. Final score a flattering 5-2 win for Southport against excellent opponents, putting Southport into the Longman Cup final. With high hopes Southport took to the lawns again on Sunday to play Woking in the final. Woking surprised Southport with their strength and skilled play, being a team of experience and rising stars. Despite Southport playing good croquet, the talent of the Southerners showed. With Tony facing an opponent with over eleven bisques, Carol and Brian facing a strong doubles pair, only Alan Farrell could salvage a win in the morning session and Woking secured a 2-1 lunchtime lead. Southport discussed tactics over lunch and felt the match could still be turned around. But this was not to be, as Woking turned up the pressure in the afternoon with formidable croquet, which Southport could not counter and failed to secure a further win. Final score: Woking 6 Southport 1 – a deserved win for a superb Woking team. A big disappointment to Southport but there was still the pride of reaching a national final, and receiving a trophy for being runners up. Picture shows the Southport team receiving the runners up Longman trophy. 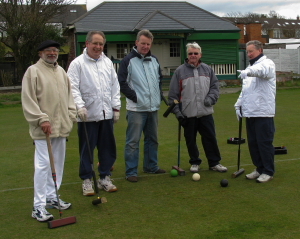 From left to right – Brian Lewis, Carol Lewis, Quiller Barrett (President of the Croquet Association), Alan Farrell and Tony Thomas.